Aling Fe and Sir Vince chatting in one of the breaks during the financial literacy training. At first, she used to buy small items like clothes, house display, and furniture and they sell it to their neighbors. When they had a bigger capital, Aling Fe and her husband started with a small lot in Santa Rosa, Laguna. According to her, every time they gain profit from their rental properties, she takes a part of it and put it in their savings. Aling Fe did not finish college because of poverty that is why she had to start helping her family in an early age. She also started to dream early of establishing a business of her own. 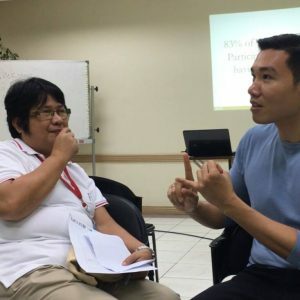 Vince Rapisura, a wealth expert and CEO of Social Enterprise Development Partnerships, Inc. (SEDPI), said that it is good to start early in learning personal financial management. That is why SEDPI’s advocacy is financial inclusion through financial literacy. Last August 2016, Monde Nissin invited SEDPI to give financial literacy trainings to their employees in Santa Rosa, Laguna as a part of their “Yaman Series” program. SEDPI trained an average of 750 employees including office staff and factory workers. Aling Fe is one of the factory workers taught by SEDPI in this program. Her business was discovered when the topic was about Passive and Active Income. Rapisura saw that her profit in her rental properties, with her salary in the factory, are more than enough to pay for all of her family’s expenses. In his book (L)Earning Wealth: Successful Strategies in Money Management, Rapisura differentiated the two kinds of income: Active and Passive. 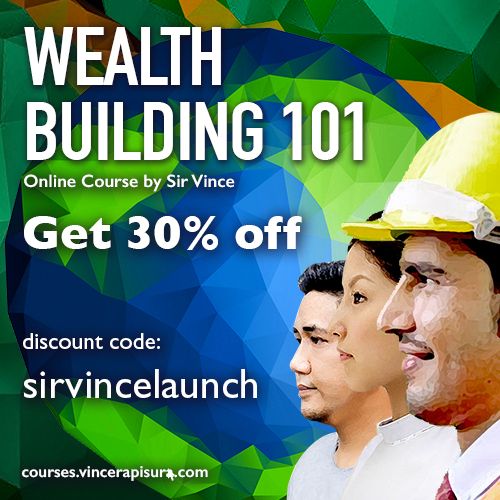 Active income can be earned through active working or pagbabanat ng buto. For example, being an employee in a company. Passive income, on the other hand, can be earned even without working. For example, rental properties, stocks, and dividends. Rapisura always asks his participants, “What would you choose, to earn while getting tired or to earn while relaxing?” Of course, the answer is always the latter. To reach financial freedom like Aling Fe, try to look for opportunities where you can get passive income. Rapisura asked her why she still let her children finish college despite her believing that one can be successful even without a college degree. All her three children have finished college already. Wanna know more about the article or SEDPI. May financial plan na kayo? Kasi kung wala pa, I cannot provide proper advice. Ang financial plan ay puwedeng ihalintulad sa check up sa doctor. Kung di ko alam ang resulta ng check up, di ko kayo mada-diagnose at mabibigyan ng tamang gamot. Para ding itong gusto mo gumawa ng bahay pero wala ka pang plano ng bahay. Hi Gilbert. I’m also an OFW in Canada. As Vincent said you need a financial plan and of course educate yourself. You can start by reading the book Wealthy Barber and the Return of the Wealthy Barber. I read both and been suggesting it whenever possible (for those who are willing to learn). Then you can also read MoneySense and follow on Facebook Rob Carrick, Bruce Sellery, Preet Banerjee, Gail Vaz-Oxlade, Evelyn Jacks and more. One thing I recommend is not to be worried if it’s taking time for you to learn. Make little steps based on what you learn. Remember what personal finance is. Take action for your future based on your goals and circumstances and not of others which bring us back to financial planning.